I had been wanting to replace the barn picture on our mantel for awhile now. I still love it but was ready for a change. I wanted a giant frame but did not want to pay a ton so while browsing the hardware store with the family one day, we came across these six foot pine planks for a privacy fence. They were cheap at under $2 a piece and rough. Perfect. Jason measured and cut the angles. We stained it using leftover stain we found in the garage from our nook project. Jason connected each piece together using "L" brackets. And my giant frame came to life at just under $12 total cost. Gotta love that! Then it was time to accessorize. The giant frame would not cut it alone. I added an old window frame and two old frames. I painted one in my favorite DecoArt Spa Blue for a fun splash of color. Filled the larger one with artwork by my five year old and the smaller one with a favorite wedding photo. The little birdie I love and I gotta keep my Scrabble tiles handy for changing up the word on top of the toy shelf! Of course, in honor of summer and because I am a sucker for a cute pennant banner, I had to make a mini one for the old window! Makes me smile everytime. I am calling it the "Happy Mantel"! I'll be partying at these blogs this week! It's no news that with 2 weeks until our little one arrives (or less! ), I have baby on the brain in a major way! There is a really good chance that I'll be taking lots of pictures of the baby. There also is a very poor chance that I'll be on top of editing those pictures enough to remember how old she was in each picture, so I wanted a cute way to mark her age that will be in the picture with her. Which is why I was SO excited to get started on these! I saw a project like this on Chez Beeper Bebe, (check out her bright fabric letter header), but I wanted my fabric to coordinate and be neutral enough that I could use it now, and again if I was photographing a baby boy at some point in the future. I wanted it to be delicate enough to use in the pictures those first few weeks when the baby is so tiny and innocent, but still sweet for a photo of a big, rambunctious 10 month old. I found the perfect fabric bundle at Raspberry Creek Fabrics here. Diana is so sweet and helped me to get exactly what I needed, she even has a discount available if you're an Etsy seller!! So great! The designs are perfect! Sunny, sweet, playful, and have a bit of a fun vintage feel to them. I went to my Silhouette to do the dirty work, cutting out all of the letters and numbers from card stock to use as templates. If you don't have a Silhouette you can easily cut some block letters and numbers by hand. You could do the whole alphabet if you'd like, but I just did the letters and numbers that I will be using for the baby's age: DAY, WEEKS, MONTH, and 0-9. I then cut my various fabrics from my fabric bundle into little 4" by 4" squares, along with some cotton fabric batting. I then pinned the fabric pieces together to be sewn. The traced letter/number was on top, then 2 layers of cotton batting, then the patterned fabric on the bottom, with the pattern facing down. I took it to the sewing machine, and using a straight stitch, sewed along the traced pencil lines. I was surprised to discover that this was actually a pretty fast project! When I sat down at my sewing machine I had all of my little bundles already pinned together, and the letters that were all straight lines (A, L, E, etc.) were finished in a pinch! But the ones with some curves were a bit more difficult. This is the first project that I have done that has required sewing that wasn't in a straight line, so I would just advise you to take it slowly. I had been sewing on a fast speed and it was difficult for me to shift the fabric around quickly enough to stay on the lines. So I started sewing my curves on a slow speed and that made a huge difference. I even hand-cranked the very small circles inside the 8 and 6, and it was still exceedingly faster than hand sewing!! There were a few where I had to pick out the stitching and re-sew the crazy looking lines (like the 2 above), but there were others that I left slightly flawed. It adds character, right? Here are the backs of some finished squares (above) and the fronts (below.) Fun, right?!! I filled my bobbin with a dark brown thread, so that is the color that outlined my letters and numbers. I cut them out, and was so pleased! You may notice that there is no 9. It turns out that you don't need it if you've done a 6. Or vice versa. But I realized this after I had already sewed the 6 and 9, so I just kept the one that looked best. :) But I made two 2s and 1s, so I could celebrate the baby's age on days like this (below) as well. Once everything was cut out, I used a bit of fray check along the edges. As the fray check dried it curled up the edges a bit. But once they were all dry, it was nothing that a warm iron couldn't take care of. And then they were perfect! I got some craft magnets with sticker backing to use if I want to temporarily attach them to something metal, and some little velcro circles if I want to attach them to fabric. Here is the whole set. I just love them, they're so sweet and versatile! My son keeps picking them up and playing with them as well, telling me the numbers, letters and sounds. I guess I could make a few more to spell out his and baby's name. It was easy enough that I really wouldn't be opposed to doing so. Hope you all have a great week! Check out the following parties where I'll be sharing these fabric letters this week. E-mail us your information and we will pass it along to Cutting Edge! 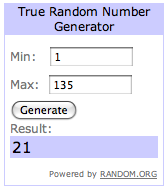 Thanks to everyone who entered! There will be more where that came from so stick with us, friends! My baby girl has her first birthday this summer and while I hate to think about her turning one, I love to think about her party! 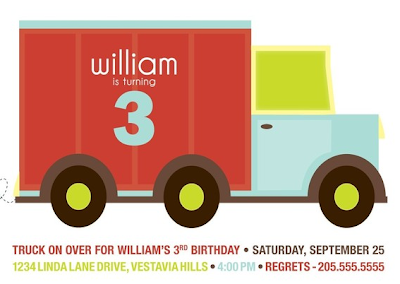 I found the perfect invitations on Etsy at Pinwheel Press. 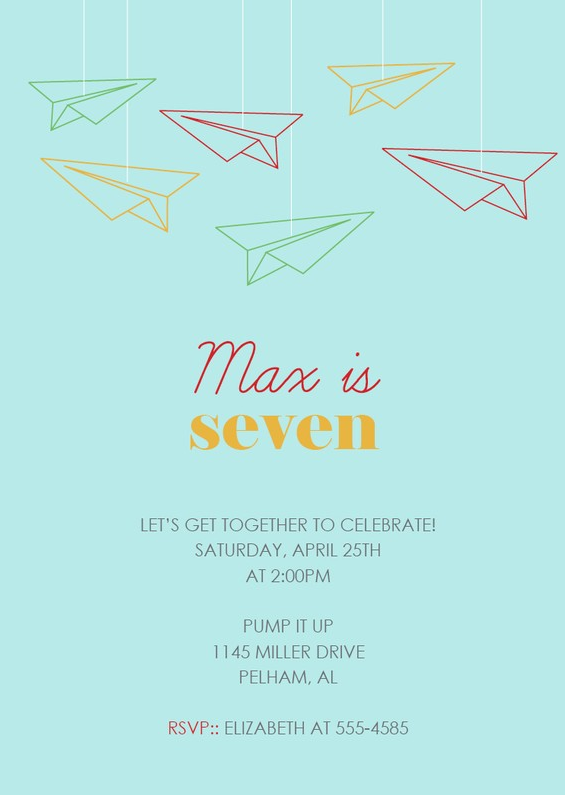 I browsed through all the pinwheel invitations and this was by far my favorite. The main colors of the party came straight from this invitation. They arrived in the mail the other day and they look even more perfect in person! I could not keep this shop a secret. I had to share it with you all. It is one of the best paper products shops out there if you ask me! Seriously, their stuff is beautiful. Simple, classic, fun, and beautiful! Are you kidding me? 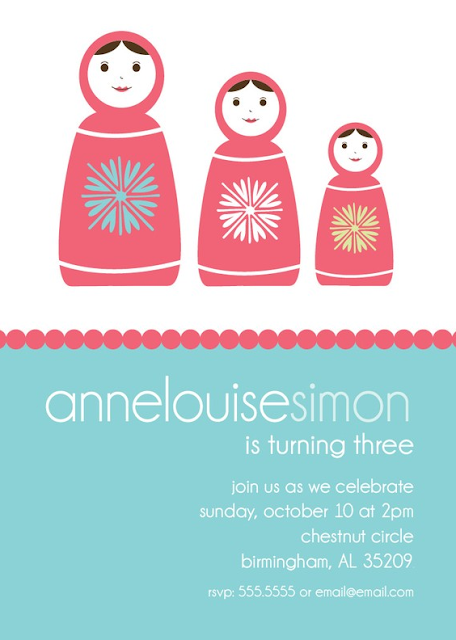 This nesting doll invitation is unique and cute as can be!!! Love how the writing is on the truck in this one. The colors are so fabulous too! And one of the cutest baby shower invites I have ever seen available in blue too! And on top of all the amazing invitations that Pinwheel Press has to offer, there are also baby announcements, save the date cards, calling cards, enclosures, and notecards. You can print them yourself or they will print them for you. 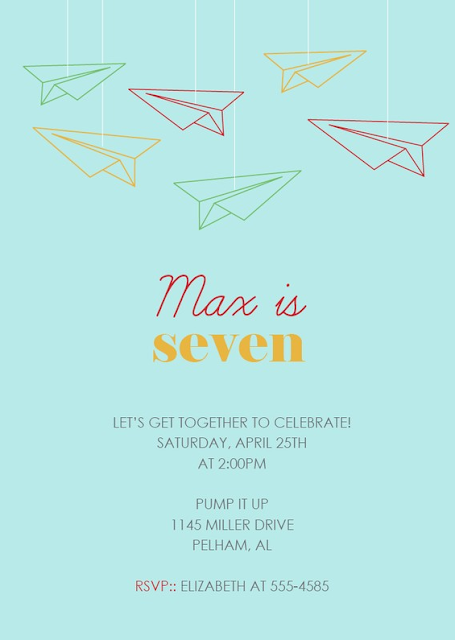 If you are looking for an invitation or almost any kind of paper product, check them out! They are sure to have just what you are looking for! Can you tell I'm a pretty big fan??? Thanks for stopping by Lemon Tree! When I first got my Silhouette Machine I spent a lot of time playing around with the different designs the software and internet store offered. One of the first projects I made was a little initial frame for my daughters gallery wall in her bedroom, and I still love it! Glued the initials to the glass part of the frame, and mounted the Silhouette design on scrapbook paper behind it. I can see this as being a great little addition to a birthday or shower gift? The ability to personalize it is endless, and it took less than 10 minutes to design and assemble! A total win, win!